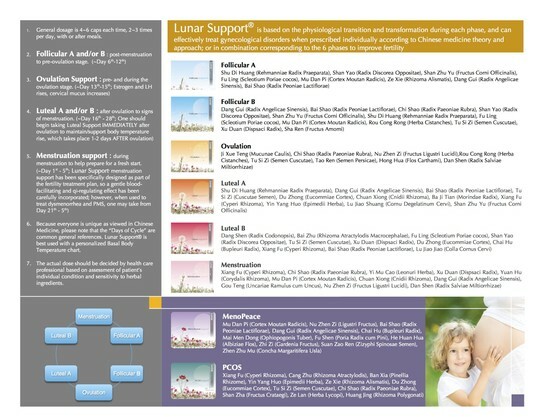 The “Lunar Support” line is a serie of 8 TCM formulas for your clinical consideration in treating infertility & menstrual disorders. 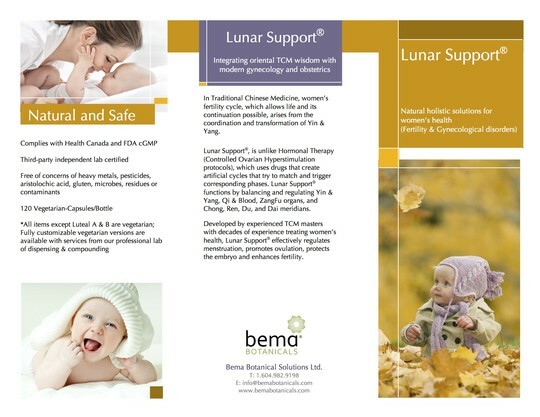 While we actively encourage and assist you to customize your own personal prescriptions using our specialized dispensing and compounding service, Bema has prepared the Lunar Support line for your ease and convenience of use in your busy clinic. prominant TCM gynecologists with evident clinical results. *Because our care is non-stop for you, we have also a special formula developed for Menopausal and related syndromes. From the period is finished till pre-ovulation stage. Usually day 1 ~ 5 of the circle. Suggested dose : 4~6 caps each time, 3 times per day. From the period is finished till pre-ovulation stage. Usually is the day 6 ~ 12 of the circle. For the ovulation stage. Usually can be the day 11 ~ 15 of the circle. Suggested dose : 4~6 tabs each time, 3 times per day. After the ovulation till the period is arrived. Usually is the day 14 ~ 28 of the circle. SALE: Lunar (Fertility) Support : (a). Buy 6 or more get FREE SHIPPING (*local Vancouver area standard; or equivalent discount) (b). Buy 10 get 1 FREE.